BittWare A10PL4 – Altera Arria 10 GX FPGA, 2x QSFP, 32 GB, PCIe x8 Gen1, 2, 3 :: Zerif Technologies Ltd. The board offers over 32 GB of memory, sophisticated clocking and timing options, and two front panel QSFP cages. The A10PL4 also incorporates a Board Management Controller (BMC) for advanced system monitoring, which greatly simplifies platform management. All of these features combine to make the A10PL4 ideal for a wide range of applications, such as network processing, cyber security, compute and storage, instrumentation, broadcast, and Signals Intelligence. The A10PL4 provides a variety of interfaces for high-speed serial I/O as well as debug support. Two QSFP cages are available on the front panel, each supporting 40GbE or four 10GbE channels. The QSFP SerDes channels are connected directly to the Arria 10 FPGA, thus removing the latency of external PHYs. The QSFP cages can optionally be adapted for SFP+. 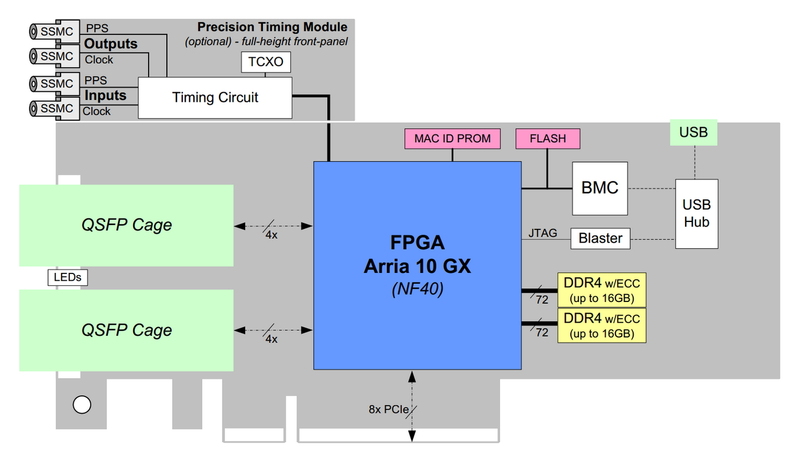 The x8 PCIe interface provides 8 SerDes lanes to the Arria 10 FPGA. A USB 2.0 interface with built-in USB-Blaster is available for debug and programming support. The board also supports timestamping with an optional precision timing module, which features 1 PPS and reference clock inputs and outputs along with precision clock circuitry. The timing module option requires a full-height front panel. The A10PL4 features up to 32 GBytes of DDR4 with optional error-correcting codes (ECC). 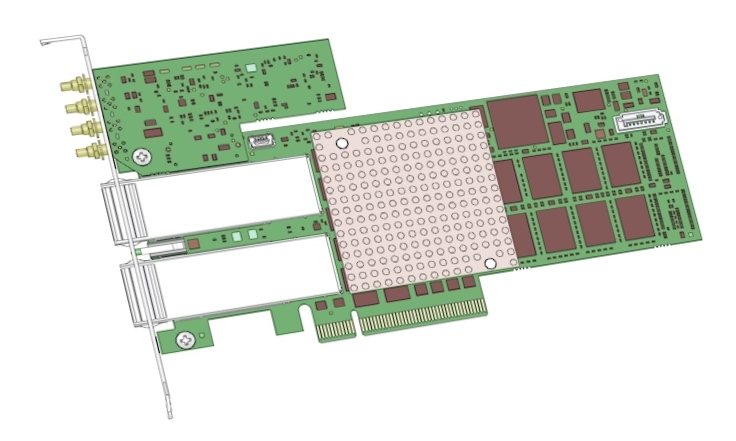 Additional on-board memory includes flash memory with factory default and support for multiple FPGA images. An on-board PROM provides access to the board’s MAC ID. Hardware accelerator diagram: BittWare A10PL4 with dual QSFP cages for 2x 40GbE or 8x 10GbE. 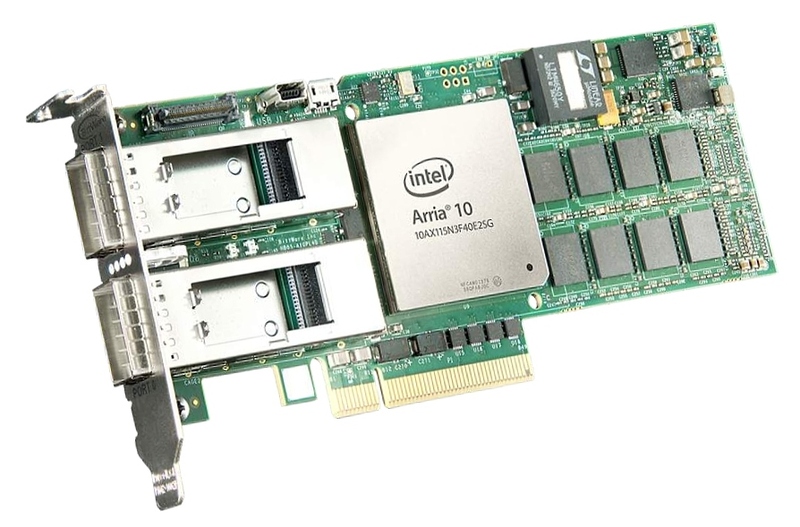 A10PL4 is a low-profie PCIe x8 card with Intel Arria 10 GX FPGA. A10PL4 with optional precision timing module. Find and Replace FPGA Accelerator Demo.